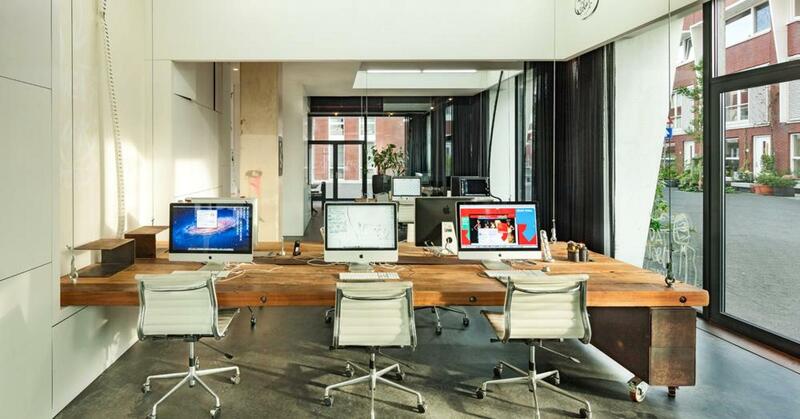 Employees at Amsterdam design studio Heldergroen won't be putting in much overtime. Not in the office, at any rate. That's because every day at 6 p.m., their desks, tables and other work surfaces, with their computers attached, are hauled up to the ceiling by steel cables normally used to move heavy props in theatrical productions. If you leave a half-eaten tuna sandwich on your desk, you're out of luck. Once the chairs and other workplace paraphernalia are cleared away, the space is free for evening and weekend use as "a dance floor, yoga studio … or anything else you can think of—the floor is literally yours," creative director Sander Veenendaal tells Fast Company. Zecc Architects built the space, working from a concept developed by Bright Green. "We think that doing activities like this makes it easier for people to work here," says Veenendaal. "You know when it is time to relax or do something else that inspires you." That sounds awesome. There's just one catch. In the morning, the desks reappear and everybody has to go back to work.